The ranking highlights leaders in sustainable design, construction and operation of buildings in the U.S. 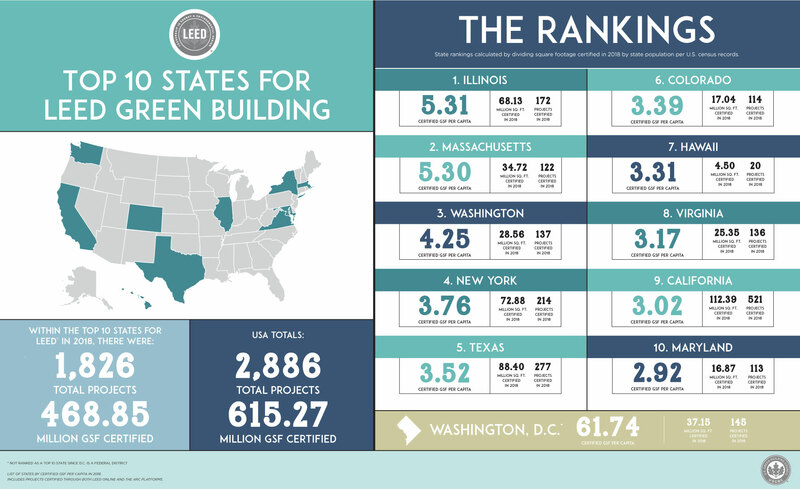 The recently announced 2018 Top 10 States for LEED list showcases significant growth of green building across the U.S., with Illinois ranking first in the nation for the highest gross square footage of LEED-certified space per person. The annual Top 10 States for LEED highlights projects and leaders who significantly enhance the sustainable design, construction and operation of buildings in the United States. Together, these states, which are home to 128 million North Americans, have certified a total of 2,886 projects, spanning over 615 million gross square feet. Now in its ninth year, the list is based on the gross square footage of LEED-certified space added in each state, using 2010 U.S. Census data. The list includes commercial and institutional green building projects that were certified throughout 2018. The benefits of LEED extend well beyond measures like reduced water and energy usage, affecting the health and prosperity of entire communities. LEED-certified projects save money for families, businesses and taxpayers, in addition to reducing carbon and creating a healthier environment in which people can thrive. We congratulate these states and leaders on their commitment to LEED and the betterment of their communities. Join us in celebrating their leadership—share your state’s ranking with your neighbors and colleagues by tagging your Twitter, Facebook and Instagram posts with #Top10LEED.